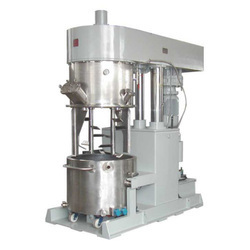 Our range of products include planetary mixer. The stirring paddle in the kettle rotates while revolution, which makes material flow around, so it can realize mixing (compounding) effect in short time. There are various blades as frame, paddle and twist of dough frame for low speed blade can be chosen. Various design ensure material work under sealed environment. Heating means of kettle can be electrical heating steam heating, hot water or oil circulation heating, intelligent temperature director can control temperature precisely.